Why did the ancients align their monuments so precisely with the stars? What were the practical and symbolic reasons behind these mysterious configurations? 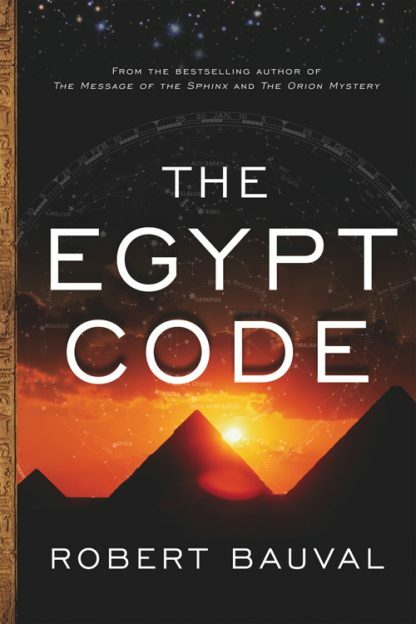 From the author of The Orion Mystery, the best-selling book that introduced the revolutionary star-correlation theory about the Giza pyramids, The Egypt Code reveals an amazing Grand Unified Plan behind the legendary temples of upper Egypt. Robert Bauval, one of the world�s most prominent and controversial Egyptologists, completes his groundbreaking investigation of astronomy as related to Egyptian monuments and related religious texts. The Egypt Code revisits the Pyramid Age and the Old Kingdom, proposing a vast sky-ground correlation for the Memphite-Heliopolis region, and presenting the possibility of a grand plan spanning three thousand years of Pharaonic civilization and involving pyramids and major temple sites along the Nile. The central idea of the book is that the cosmic order, which the ancients referred to as "Maat," was comprised of the observable cycles of the sun and stars, in particular the star Sirius, and that the changes that took place due to the precession of the equinoxes and the so-called Sothic Cycle are reflected in the orientation and location of religious sites. Robert Bauval's was born in Alexandria, Egypt, in 1948. His discoveries and theories have been the subject of dozens of TV documentaries. He and his wife Michele live in Southern Spain.